Removing wallpaper can be an intimidating prospect, and with good reason. Depending on the circumstances, some old wallpaper comes off easily, but that’s not something you’ll discover until the process is well underway. It’s best to approach the task well prepared for every eventuality. If the wall behind the wallpaper was primed or painted, it will likely make the removal process much simpler. If, on the other hand, the paper was applied to unpainted drywall, the task is going to be considerably more involved. Your best bet is to begin by removing a small section of paper and then checking to see if the wall behind has been primed or painted. If it’s unpainted drywall, you’ll need to proceed carefully so as not to tear the paper backing from the wall. Prior to beginning the project, you’ll need to obtain some wallpaper stripper. This is a liquid solution that you will spray on the wall. Starting in a corner, pull a piece of wallpaper away from the wall. It may peel away easily in one piece, or you may be able to remove it in several sections, leaving only a trace of glue residue behind. If so, you can apply wallpaper removal solution at this point, but you should take care to remove as much of the paper as you can while it is still dry; excess moisture runs the risk of damaging the wall. Apply the paper removal solution using a squirt bottle or a garden sprayer. Begin by spraying the wall at the top and move in approximately four foot sections. Saturate the wall with a fine mist, but again, don’t get too carried away. Then, using a scraper, scrape away the remnants and glue residue. Take care not to nick the wet drywall with your scraper. Continue until you have removed all wallpaper and glue. For stubborn residue, sand it away with a piece of sandpaper. This may require several pieces, because glue tends to quickly diminish the sandpaper’s effectiveness. For particularly difficult pieces and residue, it may be necessary to employ a scoring tool. Score the wallpaper and then apply more removal solution, allowing it to seep through the paper and loosen the residue beneath. Use a scoring tool only as a last resort, since it’s very easy to damage the drywall underneath. If you plan to paint the wall rather than hanging new paper, you must prime the walls so that the paint will properly adhere to the treated surface. Removing wallpaper can be a challenging undertaking, so take your time and follow these simple steps. And remember, if in doubt, it’s better to engage the services of a professional rather than to regret the outcome (and potentially extra cost) later. Having a lawn with a lot of trees is like having a dog with long hair: your house and lawn is destined to be covered with leaves. Now that it’s mid-October, it is time to think about winterization and cleaning out your gutters before any heavy snowfall – my least favorite task. It is best sometimes to just pull the band aid off quickly. Don’t think, find something old and long sleeved, grab gloves, and let’s power through this. Extend ladder and place it near the top of the downspout. If possible, buy a standoff stabilizer to attach to the top of your ladder. This will make it so that you are balanced against the roof instead of on the gutter. Check out our recommended ladders and stabilizers for gutter cleaning. Fasten a trash bag to the ladder near the top, and begin scooping out leaves near the downspout and work backwards. After cleaning out the whole of the gutter, we will test for leaks and blockages using the host. Run the hose from the furthest point, towards the downspout. The stream of water will be a good indicator of what to do next. If the stream flows steadily towards the downspout but doesn’t drain, that means more attention is needed to clean out this funnel. Luckily, there is a hose attachment that can do this. Take the attachment and instead of running it top down, feed it in from the bottom and run water through it to try and clear the clog. After a minute or so of this, try running the water from the top of the spout. If it still doesn’t drain, repeat this step. If step three led to stagnant water in parts of your gutter, they may not be hung correctly. In order to drain, gutters need to decline at the rate of ¼’ per ever 10 ft towards the downspout. Finally, while preforming step three, keep an eye on leakage. Note the spots where you find a heavy drip. If the leak is occurring at the seam of 2 gutter lengths, this is fairly easy to repair with gutter sealant along the crack. Same goes for end cap leaks. However, if the leak comes from a full on hole and not a crack the repair process will be more extensive. Clean gutters are the first step to preparing your home for inclement weather. Need help with the weatherization process? Give Handyman Matters a call at 866-FIX-MY-HOME. In recent years, more and more homeowners have begun decorating their homes for Halloween as enthusiastically as they do at Christmas time. A stroll down the seasonal display aisles at your local general merchandise retail store will quickly confirm this. There are all manner of decorations available, from simple to incredibly complex—and expensive! Don’t allow your decorations to be hazards. Keep trick or treaters and all other visitors safe when they visit your property. This means avoiding things that can be tripped over or bumped into. Mood lighting—or flashing lights—create great atmosphere, but can also cause visibility issues. Keep in mind that many trick or treaters wear costumes that limit their field of vision. Go for “safe” over “scary” and even over “creative” if there’s even the slightest doubt that you are creating something that could cause injury. It can be “dispiriting” to go to a lot of effort to create spooky effects, only to have them disappear or be damaged. Unless you can monitor your decorations closely, don’t set out expensive items or things you’ve gone to a lot of effort to create if they can be swiped or destroyed when your back is turned. Keep these items secure by displaying them in windows or out of easy reach. You might consider bringing more valuable things indoors each evening before you go to bed. Rake up a pile of leaves on your front lawn and take a pair of old boots or galoshes and position them so that it appears someone has been “buried” beneath the leaves with just their feet protruding. Dangle handmade cardboard bats and ghosts from tree limbs with black thread and let them flutter in the wind. Use cardboard, Styrofoam or planks of old wood to create a cemetery of tombstones on the grass. Wads of cotton can be gently pulled apart in strands to create cobwebs which can be strung through tree branches or stuck along porch railings and pillars. Straw or fabric stuffed into a pair of old jeans and a shirt can make a scarecrow, with a pumpkin or jack o’lantern added for a head and face. Position “him” in a rickety old chair on your porch. Gather a bunch of withered plant stalks and tie them together to make miniature corn shocks, or twine them together to make a dead wreath, festooned with wilted flowers, to hang on the front door as a grisly greeting. Not only are these easy and inexpensive things, but if they get swiped, you aren’t out a lot of money for your efforts. Just as more people are going all out on their costumes, a lot of folks are doing likewise with their decorating—lights, sounds effects, moving figures—the Halloween sky is the limit! Trick or treaters and other passersby will enjoy these displays. But be mindful and respectful of your neighbors. Ear-splitting haunted house noises and strobe lights tend to get old and tiresome pretty quickly. Check with those who live nearby to let them know what you will be doing. Keep the volume level and the mood lighting to a sensible level, and within a reasonable time frame—from dusk until 8pm or so is good; earlier if small children with earlier bedtimes live nearby. Maybe you like to greet your trick-or-treaters in costume, as well. We’ll leave that particular design choice up to you. But if you need help with the “exteriors,” particularly if they involve climbing a ladder, stringing spooky lights or positioning sound equipment in trees or on the roof, your local Handyman Matters ghouls and gals stand ready to help you “scare-ify” your home and yard quickly and safely, and to take everything down the day after Halloween, as well! 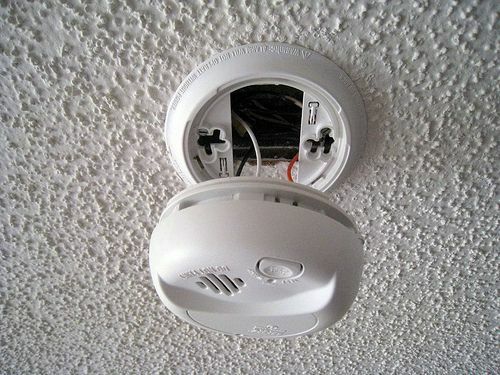 Have you replaced your smoke alarms recently? ever? According to NFPA statistics, half of all U.S. home fire deaths occur between the hours of 11pm and 7 am, when people are most likely to be sleeping. Having a working smoke alarm cuts the risk of dying in a fire by half. And remember, of course, that merely installing detectors is not enough; it’s important to check them periodically to make sure they remain in working order, and to replace the batteries at regular intervals. The American Red Cross also reminds homeowners that it’s important for all members of your household to be aware of the quickest, safest way to exit in case of a fire, and to practice this escape so that it’s firm in everyone’s mind. Both a primary and a secondary escape route should be mapped, for added fire safety. Remember to never to leave fireplaces, candles, space heaters or even running clothes dryers unattended. All have the capability of igniting a house fire. Keep curtains, fabrics and all objects away from space heaters. Never overload electrical outlets. Entryways need to be kept free of clutter and objects that might impede a hasty egress in case of emergency. Seniors and people with reduced mobility issues are at a particular risk; it’s important that they or their caregivers do a careful walk-through of their homes to make sure every step has been taken to ensure the ability to exit as quickly and directly as possible. When it comes to home repair, or building or buying a new home, it’s important to balance your desire for attractiveness with practicality and safety. Cedar siding, for example, is a popular choice, but it is also one of the more flammable surfaces. Take the time to consult with builders, carpenters and handymen to make sure all of the materials being used are designed for safety as well as for appeal. If you are unsure about the best place to install smoke and carbon monoxide detectors, or if you need assistance fireproofing your home—or addressing any other safety issues that come into play—Handyman Matters craftsmen are always available to assist with a walk-through or with any remodel or repair issues that will ensure you are living in a safe and comfortable environment. Modern design, with clean lines and a good connection to the outdoors, will be the leading housing trend for the next few years. In response to a more complex world, homebuyers respond to spaces that are simple, light, and soothing. They watch home makeovers on television, get décor catalogs in the mail, and have a wealth of online resources. Homebuyers today are aware of current design trends, and they love the clean lines of modern homes. A minimalist interior is the first step toward the modern style that today’s buyers love. Smaller spaces can be overwhelmed with stuff. Fewer things are easier to display and keep the focus on the architecture. Mid century modern furniture, with clean lines and functional design, is very popular. It is a perfect combination with a light, open interior. Sparse décor, hard surface floors, white walls, and lots of glass give a cleaner, simpler look. The downturn in the economy and the trend toward green living has led to more efficient use of space in homes. There is an interest in livability, rather than showiness. Bathrooms are smaller and more sensible, but closets are still generous. Formal living, media, or exercise rooms that are unconnected to other core areas tend to not be used. These spaces may be converted to recording studios (you need a place to play with that new USB microphone you got for podcasting) or home offices. Buyers who work online are growing in number, and they need work space at home.